Robofold: Using Robotics And Generative Software To Bend Sheet Metal! Gregory Epps uses standard industrial robots to build complex and accurate forms out of sheet metal. The forming is achieved by folding sheet metal along curved crease lines. Using the Grasshopper generative CAD software alongside Kangaroo , physics simulation software, Gregory is able to build objects not possible with other methods of sheet metal manipulation. The Robofold webpage is here and Gregory also has another site that discusses topics related to CAD and generative design. You can also watch a video of the robots assembling the chair pictured here. European Garment Industry Research Project "Leapfrog IP"
Leapfrog IP is a group research project with partners from the European clothing and textiles industries, technology companies and academia. The goal of the project was to transform the European clothing sector into a technology and knowledge based industry to give European clothing manufacturing a competitive advantage in an industry where low cost labor countries dominate. The project has ended and the results of the project are available here or on their YouTube channel here. Joking that "one of my responsibilities as commander-in-chief is to keep an eye on robots," President Obama on Friday announced a new public-private sector partnership that will be tasked with driving "a renaissance of American manufacturing." In a speech at Carnegie Mellon University's National Robotics Engineering Center in Pittsburgh, Pa., Obama laid out plans for the "Advanced Manufacturing Partnership" (AMP) . According to the president, the group will bring together top engineering universities, beginning with Carnegie Mellon, Stanford, University of California-Berkeley, Georgia Institute of Technology, MIT and the University of Michigan, and leading U.S. manufacturers including Johnson & Johnson, Honeywell, Caterpillar, Northrop Grumman and Corning. Led by Susan Hockfield, President of MIT, and Andrew Liveris, the CEO of Dow Chemical, a White House press release explained AMP will work across sectors to "create high quality manufacturing jobs and enhance our global competitiveness." The release noted that the partnership will "leverage existing programs and proposals" and invest more than $500 million to jumpstart the effort. U.S. Deputy Secretary of Defense William Lynn said the U.S. will maintain its lead in unmanned robotic technology in the face of a $400 billion reduction in defense spending. "Robotics and unmanned technology is a key future" for the U.S. military, Lynn said in Paris today ahead of this years Air Show. The Pentagon will also seek to maintain a lead in cyber security and the capability to strike long-range targets using a combination of missiles, aircraft and electronic attack, he said at briefing. The Pentagon is reviewing its long-range spending plans to meet President Barack Obamas goal of reducing spending over 12 years to help cut the U.S. deficit. Outgoing Defense Secretary Robert Gates and Leon Panetta, his successor, have said all defense programs are under review. "No country with a weak economy is going to be strong militarily," Lynn said. "So, its a strategic imperative that we tackle the budget deficit" including ways to reduce defense spending. Still, there are some areas of emerging military strength the U.S. will try to preserve, including unmanned robotic technologies, because its not clear "the exact shape they will take, or the precise advantages they will confer" Lynn said in prepared remarks that he plans to deliver at a dinner organized by the U.S. Aerospace Industries Association. For 25 years, the field of robotics has been bedeviled by a fundamental problem: If a robot is to move through the world, it needs to be able to create a map of its environment and understand its place within it. Roboticists have developed tools to accomplish this task, known as simultaneous localization and mapping, or SLAM. But the sensors required to build that map have traditionally been either expensive and bulky or cheap and inaccurate. On November 4, a solution was discovered-in a videogame. Thats the day Microsoft released the Kinect for Xbox 360, a $150 add-on that allows players to direct the action in a game simply by moving their bodies. Most of the world focused on the controller-free interface, but roboticists saw something else entirely: an affordable, lightweight camera that could capture 3-D images in real time. Within weeks of the devices release, YouTube was filled with videos of Kinect-enabled robots. A group from UC Berkeley strapped a Kinect to a quadrotor-a small helicopter with four propellers-enabling it to fly autonomously around a room. A couple of students at the University of Bundeswehr Munich attached a Kinect to a robotic car and sent it through an obstacle course. Robots were a major force in the automation drive that made Japan the most competitive nation in manufacturing in the 1980s. That glory seems to have faded in recent decades, and Japanese robotics are no exception. Once upon a time, a charming American robot called James met a striking German bot by the name of Rosie. They liked each other, so they moved in together. Now they spend their days taking long walks in the lab and doing other things that robots do. James is a PR2 robot, built by U.S. robotics firm Willow Garage, and it traveled to Germany as part of the PR2 Beta Program, an effort to popularize personal robots. At the Technical University Munich (TUM), James was introduced to Rosie, a dual-arm robot with a curvy figure and four eyes. Their courtship was at first a bit mechanical, but they soon found many things in common: Both run ROS ( Robot Operating System), use Hokuyo laser scanners and Kinect 3D sensors , and have omnidirectional mobile bases . On a recent spring morning, James and Rosie were seen together cooking the traditional Weisswurst Frühstück , a Bavarian sausage breakfast. Presentation by Tully Foote of Willow Garage - "Open Source Robotics for the Home" which covers ROS, TurtleBot, and more. ROS is an open source Robot Operating System that is catching on and promises to allow faster development of robotic systems. .
Intel Invests into Development of Humanoid Robots. Intel Capital, an investment organization that belongs to Intel Corp. has made its first robotics industry investment, leading a $13 million investment in Aldebaran Robotics. The funding from Intel Capital will play a key role in allowing Aldebaran to develop its product offering into additional vertical sectors such as health and social care. “Robotics is an area that Intel Capital has been interested in for some time. Aldebaran’s work in areas such as voice interaction and video analytics really highlights the advances made in perceptual computing and has the potential to offer innovative products and solutions across a range of sectors," said Marcos Battisti, managing director of Intel Capital in Western Europe and Israel. The company currently manufactures and sells advanced, programmable humanoid robots focused on the education, personal services and research markets. Its products combine a range of facial and voice recognition technologies with location awareness capabilities, providing a flexible platform for application development. The investment from Intel Capiral and other partners will also help Aldebaran streamline its production operations and increase its research and development capabilities. Liquid Robotics, a Silicon Valley startup, has raised a $22 million round of funding to expand its fleet of self-propelled, solar-powered, ocean-going robots. Called Wave Gliders, the robots currently are roaming the worlds oceans to monitor oil and gas wells, keep tabs water quality in the Gulf of Mexico and gather data on the melting of Arctic icecaps, according to Bill Vass, Liquid Robotics new chief executive. These Roombas-of-the-sea deploy fins that tap the up-and-down movement of waves to propel themselves through the ocean while solar panels power the Wave Gliders sensor and communications arrays. The base model costs $100,000 and Liquid Robotics has deployed nearly 100 Wave Gliders over the past year-and-a-half that have racked up 150,000 miles of ocean travel, according to the company. IEEE Robotics and Automation Society have awarded the 2011 Pioneer in Robotics and Automation Award to Dr. Mark W. Spong for his innovative contribution to the field of robotics. The Pioneer Award was aimed at honoring persons who have explored new areas of engineering, development or research that played a major role in the growth of robotics and automation. The society selected Spong for his original contributions in the field of robotic control and teleoperators. He has also made significant contributions in the field of robotics education. 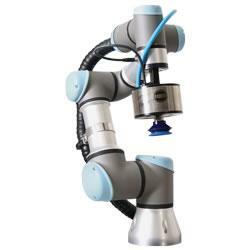 Spong has authored and co- authored numerous research papers in the robotics field. Californias Jet Propulsion Laboratory and New Mexicos Sandia National Labs have utilized systems based on the theoretical fundamentals of robot control established by Spong. The results of his work over the past 30 years have been applied in systems used by R&D facilities and companies worldwide.